This was the none-too-subtle way in which the RSC’s Deputy Artistic Director Erica Whyman shifted Saturday’s public discussion session – “Why are we not acting on our understanding of the climate crisis?” – away from the issue of the company’s controversial BP sponsorship and onto more comfortable territory. The talk was taking place, appropriately enough, before a showing of Kirsty Housley and Matt Hartley’s shocking new play Myth at the RSC’s Other Place. The play explores our tendency to ignore the uncomfortable topic of climate change, and carry on as if nothing is happening, even when the evidence comes crashing in on all sides. The fact that the RSC is essentially doing exactly that by helping to promote one of the companies most responsible for this climate crisis through its £5 ticket scheme for 16 to 25-year-olds, is deeply problematic, and the irony of the situation was thrown into relief by this event. After comments from the rest of the panel, she firmly moved the discussion on to other topics, citing the limited time available, before I or my companion – a climate change author and carbon footprint expert – could respond to the issues she raised. This meant that we weren’t able to point out that corporate sponsorship and philanthropy makes up only 3.7% of the RSC’s annual income, and almost half of that money is spent on the costs of raising it. Over 70% of the RSC’s income is from ticket sales and other trading income. Since 2014, this has included a surplus profit of over £4 million per year, in part from the incredible ongoing success of Matilda the Musical, which has been transferred into a “Strategic Investment Fund”. BP’s contribution has been estimated at around £375,000 per year – less than 0.5% of the RSC’s income, and less than a tenth of its annual surplus. Of course, there is a lot we don’t know about the RSC’s finances, but I believe it is worth asking the question: if the RSC wishes to strategically invest in building its future audience through a young people’s ticket scheme, could it draw on its surplus in the short-term to transition away from its reliance on a company that is directly threatening those same young people’s futures? We also didn’t get the chance to explain that while of course there are ethical issues surrounding many sponsors, fossil fuel companies like BP are increasingly regarded as beyond the pale, consigned to the ‘untouchable’ corner alongside arms and tobacco manufacturers. 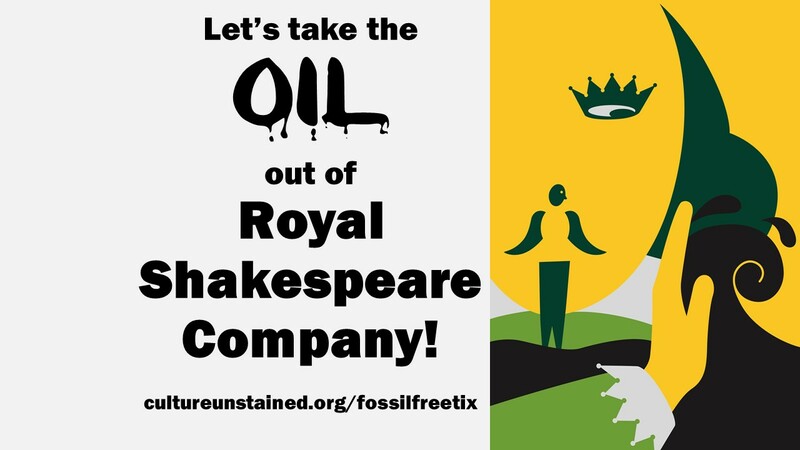 BP’s sponsorship deals with Tate and the Edinburgh International Festival both ended last year, and hundreds of artists and arts institutions – including the Royal Court – have signed up to a public commitment to never directly take fossil fuel money. There are clear reasons for this: the urgency of the climate crisis, and the active and direct role that companies like BP play in making it worse, both by lobbying to weaken climate legislation and block renewable energy, and by charging ahead with extracting ever-riskier and more carbon-intensive sources of fossil fuel just at the point where we need to rapidly transition away from them. Finally, we didn’t get to ask what kind of ethical scrutiny had been applied to the sponsorship decision. Did the RSC know that BP is one of the biggest lobbyists against European climate action; that it funds climate change-denying politicians while pushing for massive new pipelines across North America and Europe; that is works closely with, and benefits from, repressive governments in Egypt, Azerbaijan and Indonesia? Was the RSC aware of these facts and agreed to publicly align itself with BP anyway, or did it simply fail to do its homework on these issues? Matt Hartley and Kirsty Housley, the writer and writer/director of Myth, both expressed their discomfort at BP branding, especially for tickets to this particular play. Kirsty was quick to point out that she’d felt no pressure from the RSC to censor the content of Myth to please their sponsor, but she also warned: “As self-employed theatre-makers, whose income is precarious, there’s a massive amount of self-censorship” with regard to raising ethical concerns about sponsors. Mark Ravenhill has gone as far as to identify a “climate of fear” among theatre professionals who dare not criticise donors like BP. This is why, in partnership with young theatre-goers and theatre professionals, we’re crowdfunding our own alternative Fossil Free £5 tickets for 16-25 year olds. Our new scheme – which gives young people access to affordable RSC tickets without needing to promote BP in the process – is endorsed by Mark Rylance, Vanessa Redgrave, Andrew Garfield, Emma Thompson, Tamsin Greig, Caryl Churchill, Kristin Scott Thomas, Maxine Peake, Simon McBurney, Miriam Margolyes, Zoë Wanamaker, Vivienne Westwood, Max Stafford-Clark, Jasper Britton and many other theatre professionals. You can learn more, donate to the scheme or request Fossil Free £5 Tickets here. Maybe we’re all in denial about climate change, but by branding tickets for young people to see this play with a BP logo, the RSC is looking painfully hypocritical. I’ve now spoken about this with audience-members leaving Myth on two occasions. Many have done a double-take when I’ve told them that the organisation behind this unflinching production is sponsored by an oil company. It’s hard to see how the RSC can maintain its deeply conflicted position for much longer.